People have been asking me about the Lynch motor, a per-mag motor with an axial-flux design (pancake shape). Lynch motors have a reputation for having an outstanding power-to-weight ratio; and unlike the series wound DC motor, they are quite compatible with regenerative braking. However, almost every Lynch motor I've seen has been in a small EV, like a go-kart or a scooter. Today I'm talking to Dr. Paul Pancella, a physics professor at WMU, who has twinned two Lynch motors together in his Hondatron to get full-sized performance from a half-sized motor (50 pounds). The short version? Lighter motor, better performance. And regen. 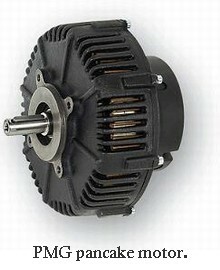 Lynne: I've heard of series wound DC motors and 3-phase AC motors for electric cars, but haven't seen as many of the permanent magnet motor type. Paul: As you know, DC motors can be broadly separated into two types: AC and DC, depending on how they get their electric power. My Lynch motor is DC. The basic idea of an electric motor is that electrical power is used to create magnetic fields, which push against each other to put the rotor in motion. Let's call the part that moves the 'rotor', and the part that stays stationary the 'stator'. Both rotor and stator have to have magnetic fields for the motor to work, and at least one of them has to be changeable in sync with the rotation. A "permanent magnet DC" motor (PMDC) has permanent magnets supplying one of these fields, usually on the rotor. 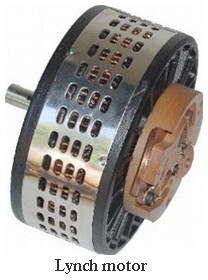 Motors without permanent magnets, such as the series-wound motors commonly used by converters, use coils to make both fields, on the stator and the rotor. The engineering challenge of getting relatively high current into the moving rotor coils is apparently balanced by the cost of permanent magnets. At the scales we are talking about, copper is sufficiently cheaper than magnets that most motors of this size tend to have wound coils on both elements. Before the advent of rare earth magnets (which have more magnetization density than iron magnets) a series wound motor was not that much heavier than a comparable PMDC. Around the time that rare earth magnets became reliable and reasonably economical, the "pancake" or axial-flux arrangement was refined, which made better use of the fixed amount of magnetic flux. These things combine so that now this type of PMDC has much better power-to-weight ratio than the series wound motors. The vast majority of electric motor applications don't care that much about power-to-weight ratio, so the cost advantage of series wound motors persists (as they are manufactured in much larger quantities). For transportation purposes, a better P/W ratio can increase performance, but since we have to carry around so many pounds of batteries anyway, even here the pancake-style motors have been slow to catch on, and so remain much more expensive (a very small market). Cedric Lynch was an early developer of a motor of this type big enough to drive a vehicle, and he founded Lynch Electric Motor Co. in Great Britain. At some point, he left LEMCO and joined/founded Agni motors, which markets a motor which is very similar to the original Lynch. LEMCO still makes and sells a range of Lynch motors, and that's who I dealt with (they've since changed the name to Lees Motor Co). Perm is apparently the name of a German company that makes a similar motor called the PMG. Briggs & Stratton has the license to sell the ETEK motors, also similar, apparently formerly known as the "Mars" series of motors. 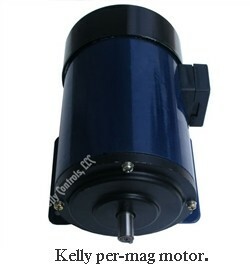 Cloud Electric has one of the larger lists of pancake motors in one place. You may notice that all of these motors tend to be much smaller and less powerful than the average motor used in a passenger car conversion. They also top out in rated max voltage at about 90 V. They are therefore most useful in go-karts, boats, motorcycles, and other small vehicles. But if you search the Lynch site carefully, as I did, you find an easy solution with enough power to push around a compact car (if you stay away from lead batteries). You can see this "LEM 2x2" concept here. The idea of LEM 2x2 is simple. Two identical motors drive a single shaft, and so their power simply adds. They can be wired in parallel or series, and one controller is sufficient to drive them as a single load. To keep the current reasonable, I went the series route, so two motors with an 80 V limit become one motor well-matched to a 160 V battery pack. The real reason I ended up with this motor is that, at the time, this Lynch 2x2 was the only PMDC I could find with enough power to move my car. I wanted a PMDC, not because of the P/W ratio, but because I really wanted to use regenerative braking. It is possible in principle but very difficult in practice to use a series wound motor as a generator when slowing down. On the other hand, Kelly controllers already had a controller at the time that would do regen with a PMDC, and the controller was still cheaper than many others. My search led to the Lynch, and I swallowed the extra cost in order to get regen. I paid about $4000 in 2008, a victim of a very unfavorable currency exchange rate with Great Britain. Looks like it would be a bit cheaper now. So yes, two pancake-style motors packaged as one unit, constructed to drive a single output shaft by the manufacturer. 50 pounds is the total weight of this dual motor unit. Only one controller required, when sized appropriately. The efficiency peaks at around 90%, according to manufacturer specs, not that much greater than the average EV motor, but a big difference in the ratio of power to weight. And in a small car like mine, saving that 75 pounds or so is significant, and means I don't need as much power for the same performance. This is especially relevant now in the lithium age. I don't think the sound it makes is remarkable, about like any other electric vehicle motor. I also don't think there is any difference in electrical noise broadcast by either series wound or PMDC motors. In my case, I can listen to radio stations while driving, if they are strong enough. And most modern DC controllers are programmable; I think people are getting away from the old Curtis boxes. So for my purposes, this Lynch PMDC motor turned out to be a good choice. I can get over 60 hp of peak power, and have no problems running continuously up to highway speeds in the local terrain. The power is quite enough to drive my 2300-pound car, and with LiFePO4 batteries I have enough capacity to run 100 miles on a charge (with regen). I don't think this motor would do as well on a much heavier vehicle, or one that carries a lot of cargo or passengers, but for me it's been great.